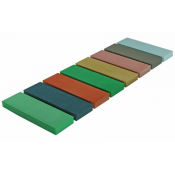 Sharpening stones are delivered with several grit sizes. The larger the number, indicating the roughness of the stone, the finer is the grain that it's made of. The finer the grit, the sharper is the result. You begin the sharpening process with a coarse grit and then continue with a finer grit. 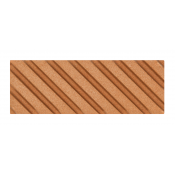 We recommend using 2 to 3 different roughnesses. 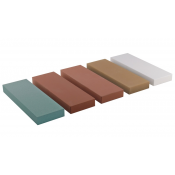 SpecificationsBrand: NaniwaType: sharpening stoneGrit according to supplier: 800Length: 21 cmWidth: ..
SpecificationsBrand: NaniwaType: sharpening stoneGrit according to supplier: 1000Length: 21 cmWidth:..
SpecificationsBrand: NaniwaType: sharpening stoneGrit according to supplier: 2000Length: 21 cmWidth:..
SpecificationsBrand: NaniwaType: sharpening stoneGrit according to supplier: 3000Length: 21 cmWidth:..
SpecificationsBrand: NaniwaType: sharpening stoneGrit according to supplier: 5000Length: 21 cmWidth:..
SpecificationsBrand: NaniwaType: sharpening stoneGrit according to supplier: 8000Length: 21 cmWidth:..
SpecificationsBrand: NaniwaType: sharpening stoneGrit according to supplier: 10 000Length: 21 cmWidt..
SpecificationsBrand: NaniwaType: sharpening stoneGrit: 12 000Length: 21 cmWidth: 7 cmHeight: 2 cmUse.. The Naniwa Combination Stones are the improved successors of the Work Stones. 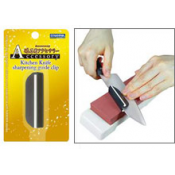 Naniwa has renewed the..
SpecificationsBrand: NaniwaType: sharpening stoneGrit according to supplier: 6000Length: 21 cmWidth:.. 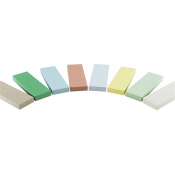 When the surface of your water stones has become hollow, this stone can be used to quickly flatten i..